A windmill is a type of engine. It uses the wind to make energy. To do this it uses vanes called sails or blades. The energy made by windmills can be used in many ways. These include grinding grain or spices, pumping water and sawing wood. Modern wind power machines are used to create electricity. These are called wind turbines. Before modern times, windmills were most commonly used to grind grain into flour for making bread. 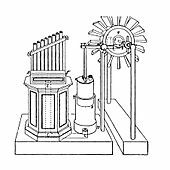 An organ powered by a windwheel was written about in the 1st century AD by the Greek engineer Hero. It could have been the first machine in history that used wind power. Vertical axle windmills were used in eastern Persia (Sistan) by 60 AD. 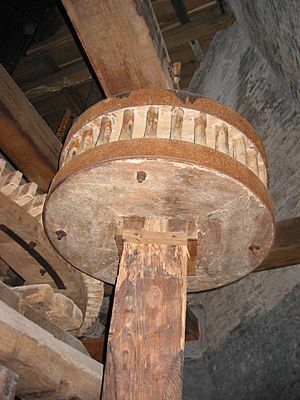 Horizontal axle windmills were invented in Northwestern Europe in the 1180s. This is the type often used today. 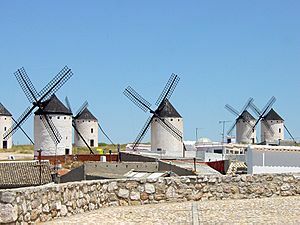 The first windmills had long vertical shafts with rectangle shaped blades. They existed in Persia in the 9th century. There is a story about a windmill and the second caliph Umar (634\644 AD). It is not known if this is a true story. These windmills were made of six to twelve sails. The sails were covered in reed matting or cloth. They were very different from European versions. A similar type of vertical shaft windmill with rectangle blades can also be found in 13th century China. They were used for irrigation. Miguel de Cervantes' book Don Quixote de La Mancha has an important scene in which Don Quixote attacks windmills. He thinks that they are violent giants. Because of this, La Mancha and its windmills are famous. This is also the origin of the phrase "tilting at windmills". It means an act of uselessness. "Moulin Rouge" translated directly from French means Red Windmill. A modern wind turbine in Sweden. Windmill Facts for Kids. Kiddle Encyclopedia.